On April 4th, USC Comedy and the SCA Council on Diversity & Inclusion hosted a special 30th Anniversary screening of the landmark independent film Hollywood Shuffle. The self-financed comedy about a young actor whose experiences in show business mirrored those of writer, producer, director, and star Robert Townsend, was a revolutionary achievement when it was released in 1987. It deftly satirizes the industry, exposing racism and the stereotypes Hollywood creates through its portrayal of Black people. 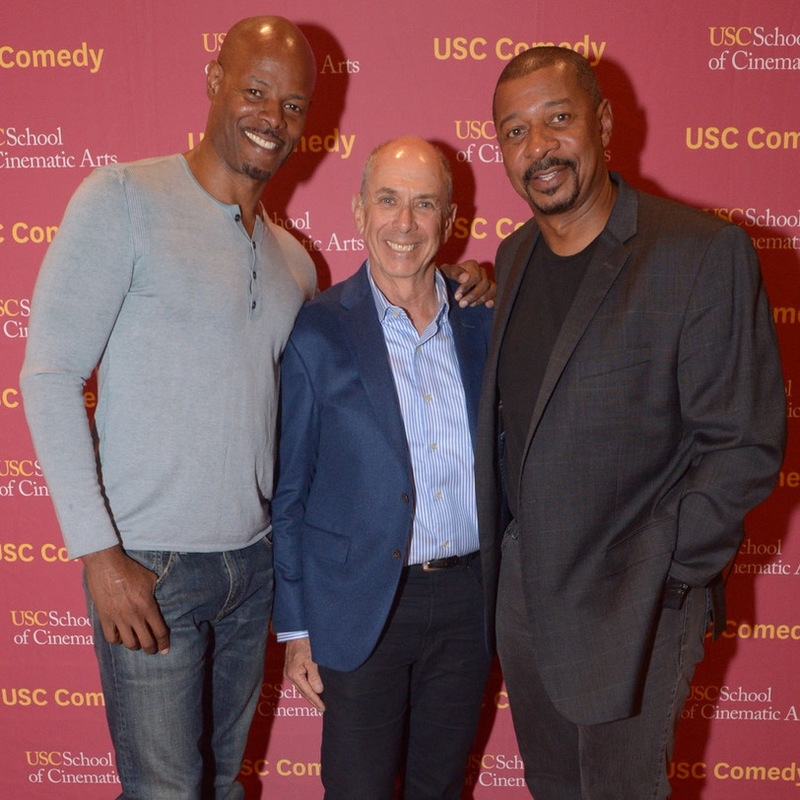 Following the screening, Townsend and Keenan Ivory Wayans, who co-wrote and co-starred in the film, spoke about the film with USC Comedy Professor Barnet Kellman. Townsend told the audience about when he first realized the discrepancy between the Black characters that Hollywood created and Black characters that people of color created. “—Bad Drug Dealer. Or the basketball player who couldn’t read.” Townsend interjected. “—Yeah, so a lot of this movie came from our frustration with our real experiences.” Wayans said. Townsend and Wayans also spoke about how resourceful they had to be in making the film at a budget of just $100,000. The film was financed with $60,000 of Townsend’s own money from his movie and commercial work and the rest was financed through credit cards. Only after the movie was made and Townsend convinced Sam Goldwyn of MGM to distribute the film was Townsend able to recoup the investment in his project and pay his actors and crew. Townsend relied heavily on the resources of his network: leftover, unused film donated from the movie A Soldier’s Story, which Townsend acted in and starred Denzel Washington; the talent and time of his fellow actors, including Keenan’s now-famous brother Damon; and shooting on location early Sunday mornings when the city was asleep and they were less likely to attract attention from the police. “If we could survive the projects, we can do anything. There is always a way to make it work.” Townsend said. That mentality was something they still carry with them, and encourage young filmmakers to keep as well. “You really don’t need money to make movies. For so long, artists have had handcuffs on because they didn’t have the money to express themselves. And now, you can use your phone, you can use your computer – the [cost of] tech has come way down,” Wayans said. Townsend mentioned that he and Wayans recently had a conversation about whether they would be able to replicate Hollywood Shuffle in today’s current landscape, citing the emergence of Black representation in shows like Scandal, Empire, Being Mary Jane, Queen Sugar, and even reality television. Townsend said the lens from which you would do something like Hollywood Shuffle would look different. When asked about current opportunities for Black creatives and the most recent #OscarsSoWhite controversy, Townsend and Wayans said the leap in visibility for Black creatives is certainly hopeful but expressed the importance of exercising caution. “I think there’s definite progress. There’s no denying that there is progress. But there is not equality. There’s a difference between progress and equality. So, as long as there is inequality [that gap] still exists. “I want to see that explosion. I want to see that artist revolution. I want to see that talent making something other than a super hero movie every three months,” Wayans said excitedly. Despite the obstacles still present in the industry for people of color, Townsend urged resilience and tenacity and the importance of giving back, citing the most recent development in his career: a teaching position in the Film & Television Production Division here at the School of Cinematic Arts.